São Paulo, Brazil, October 27, 2016 – GE (NYSE:GE) today announced it has secured a more than $900 million turnkey order with Centrais Elétricas de Sergipe S.A. (CELSE) for Brazil's Porto de Sergipe combined-cycle power plant. With a generating capacity of 1,516 MW, the facility will be the largest gas power plant in Latin America and can deliver an efficiency rate of over 62%. "Porto de Sergipe will transform the way power is delivered in Brazil, and we're confident that GE is the right partner to deliver the full scope of this project through its optimized gas power solutions," said Eduardo Antonello, CEO of Golar Power, an owner of the project company CELSE. "We look forward to working together to supply more affordable, reliable and cleaner energy solutions to the people of Brazil." The plant will feature three of GE's world-record-setting HA gas turbines and a steam turbine, as well as a heat recovery steam generator (HRSG) and other related equipment added to the GE portfolio through the Alstom acquisition nearly one year ago. The contract also includes a robust transmission system provided on a turnkey basis by GE Energy Connections. This system incorporates a high voltage step up substation at the power plant, transmission lines and a bay at an existing substation. "GE's HA technology is faster – capable of delivering full power to the grid in under 30 minutes - and able to achieve more efficiency than ever before, and it's changing the way our customers deliver power around the world," said Joe Mastrangelo, president and CEO, Gas Power Systems at GE Power. "When we tap into the GE Store and combine the HA with other innovative technologies across GE, it's a game changer that will make a real difference in meeting the growing energy demands in Brazil." Once complete, the combined-cycle plant, located at Barra dos Coqueiros, will account for an estimated 15% of Northeast energy demand in Brazil. In addition, with an extensive amount of wind and hydro power in Brazil, GE's 7HA technology will play an important role in enabling a quick response to fluctuations in grid demand and adapting quickly to weather changes. The plant's first operation is scheduled for January 2020 as part of the Governador Marcelo Déda power generation complex. "Our world depends on electricity to power people's lives and Brazil's demand for energy is expected to continue to grow," said Reinaldo Garcia, president and CEO, Grid Solutions at GE Energy Connections. "This new power plant allows the country to meet growing demand, providing the necessary complement to its intermittent renewable energy sources. Our role is to ensure the reliable, efficient and safe connection from the power plant to the electricity grid. 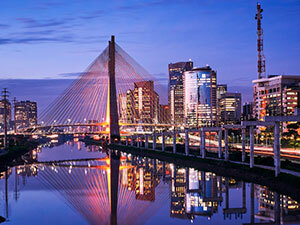 We are proud to provide the connective fiber delivering energy to the Brazilian people,"
GE has a longstanding presence in Brazil of 96 years. Today, there are more than 12,000 GE employees in the country based throughout 10 GE businesses, including 29 production and services units and one of our main hubs for innovation, a Global Research facility that was inaugurated in 2014. Additionally, GE equipment helps power one-third of all energy generated throughout Latin America.